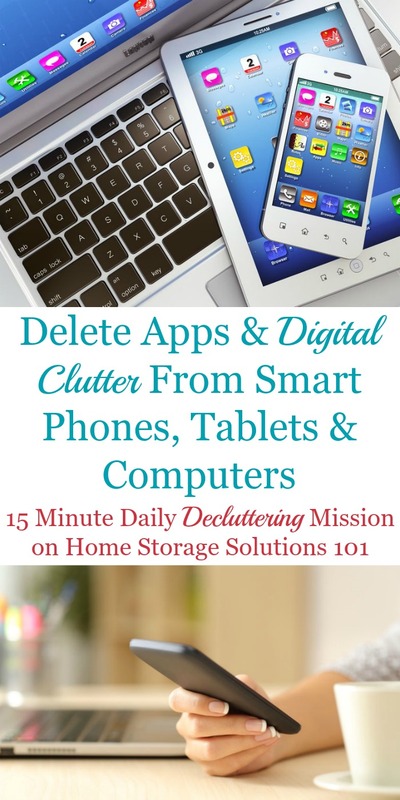 Today's mission is to declutter and delete digital clutter from your smart phones, tablets and computers. This includes deleting apps and software, and to at least consider a list of other items you may want to remove from these devices to help your phone or tablet run better, more quickly, and be more functional for you without the junk slowing it down. 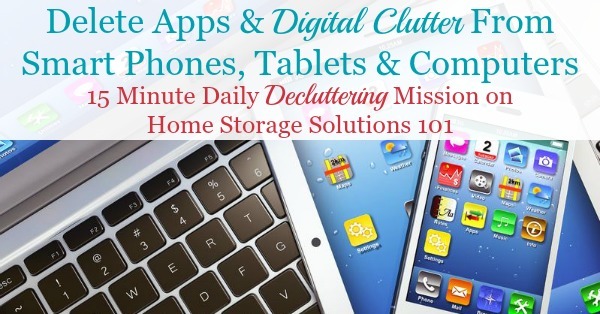 We're working on this mission while we do the Organize Email & Other Digital Information Challenge this week, as part of the 52 Week Organized Home Challenge. Just like with many other types of digital organization, this is the type of mission you should do regularly though, perhaps once every month or so, instead of just once a year. It may take longer the first time you do it because you've accumulated more clutter during the longer period you've had your phone or tablet, but each subsequent time won't take very long at all, and you'll be able to enjoy your devices more in the mean time. These days our tablets and smart phones are actually mini-computers you can carry around in your pocket or purse, and so just like computers they need to have the files and other information stored in them decluttered and organized from time time. Just because digital clutter doesn't take up physical space doesn't mean it is completely harmless. Sure, at least all those files don't take up a couple filing cabinets, but instead fit on a tiny chip, but you still have to sift through junk when trying to find the file you want, which can take your time and try your patience. In addition, while they come out each day with devices with more and more memory and storage space, it is still not finite. Removing the junk allows you to avoid that dreaded message that says you've run out of space for more stuff you do want. There are some things you'll delete or remove from your smart phone or tablet that you don't want to keep anywhere. Other things on the list you may want to keep somewhere, but you don't need a copy on your phone, for example, because you'll keep it elsewhere instead. Remember to make sure you've backed up anything you do want to save, elsewhere, before you begin to delete it from a tablet or smart phone. Also, with syncing these days, make sure when you delete it one place it only deletes it from that one spot and not everywhere before you delete everything. If you downloaded and installed an app, but you haven't used it in over three months (excluding emergency apps like those used to find your phone, or your ICE app it's time to delete them. Here's some instructions for how to delete apps from your iPhone, and similar instructions for removing apps from your Android device, Samsung or Kindle Fire. If you've got a lot of apps you do use, and want to keep, you should consider organizing them into folders, grouping similar apps together for easier reference. In addition, for most apps, don't worry if you have regrets about deleting them. Instead, you can just reinstall them again on your device because you've already paid for them (or they were free to begin with). If you play a lot of Facebook games or take quizzes, or any of your Facebook friends do, chances are high that you (or your friends) have authorized third-party app owners to access some or all of your personal Facebook data. You should make sure you've updated your Facebook privacy settings to keep any information you don't want apps to collect from doing so. Here's my article with 5 steps to delete third party Facebook apps that you don't want to have your Facebook data. Similarly, to apps, you can delete software from your computer or laptop that you don't actually use, or don't like. This will free up storage space on your computer. We all get way too much email these days it seems, and a lot of it is stuff you don't need, at least not in the long term. Regularly clear out your email inbox and folders, as well as regularly unsubscribe from email lists you don't want to be on. This type of digital clutter is so pervasive, I've devoted several missions within Declutter 365 to the process of eliminating it. You can learn more about decluttering your email inbox here, and stopping unwanted emails here. If you enjoy listening to audiobooks and podcasts like I do, you may know that after you've finished an episode or book it doesn't automatically delete from your phone or tablet. These files can take up a lot of memory and storage space, so periodically go in and delete listened to episodes and books so you always have room for fresh content. Have you looked at your contacts lately to see if you really need all of them? If you've done the Organize Contact Information Challenge here on the site, perhaps you have. But if not, it's time to look through and delete people you don't even remember, or information you know is no longer accurate. You can save certain websites and web pages as bookmarks in your Internet browser on your computer, tablet or smart phone. Look through your bookmarks and only keep those where you actually regularly visit those pages. If you receive files and documents, as well as downloads, on any of your devices, make sure to remove any old or outdated ones, and back up the rest into a more secure way to store them for later reference. For example, if you receive an attachment in an email, and you want to keep the document, it works best to download and save that attachment as a file within your organized computer files, which will allow you to more easily file that document later. Then, you can delete the email (or at least you can file the email into an email folder instead of leaving it in your email inbox). 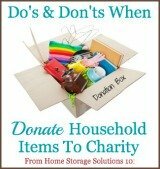 You can get more ideas for decluttering and organzing computer files here. A lot of texts, voicemails, and electronic notes can be deleted since they're about transient things that don't need to be kept long term. Finally, look at your camera roll on your phone and delete unwanted videos and photos. These take up a LOT of space on our phones, so only keep some that make you smile. Some pictures that turned out badly (such as that one of your thumb instead of the intended subjects) can be completely deleted, while others can be deleted from your phone after you back them up into a different storage system, such as Dropbox. You can check out more information about how to declutter digital photos here in this article on the site. I hope these instructions have gotten you inspired to delete apps and other digital clutter in your own life today.